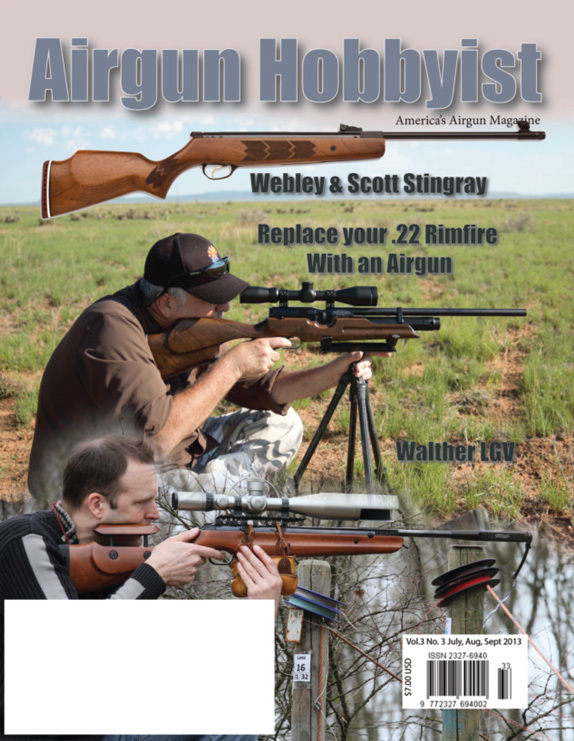 New, July 2013 Issue of Airgun Hobbyist Magazine Published. - Reviews of the Umarex P.08, and RWS C225 pistols, the Hatsan AT-P2 pistol/carbine and the Benjamin Trail NP Break Barrel Pistol. - Comparisons of the Airforce Condor and Talon PCP air rifles, also of the Benjamin NP rifle series. 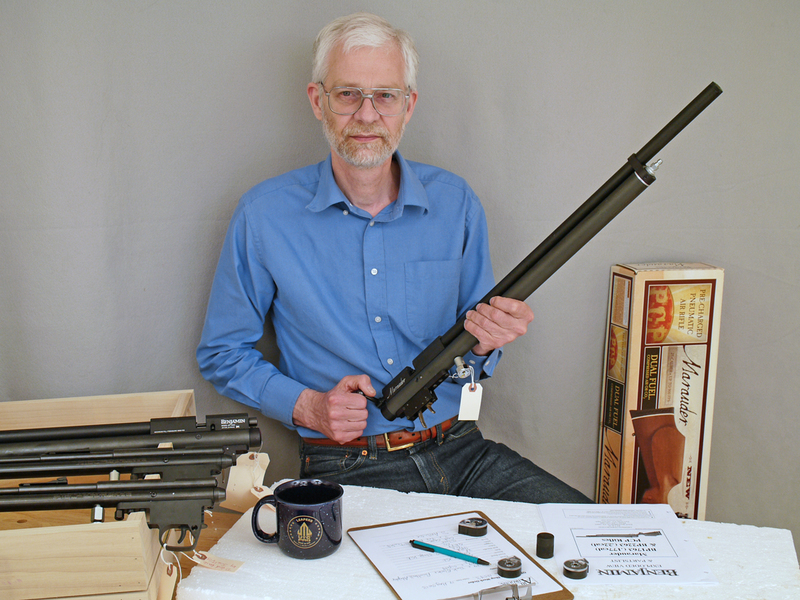 - Reviews of the Walther LGV Competition Ultra and Webley Stingray air rifles. There's much more besides. Happy Reading! You can purchase a subscription to Airgun Hobbyist magazine from the Archer Airguns online store. One of our design aims in the QB78 Repeater and QB79 Repeater project has been to offer consistent muzzle velocity over multiple shots. 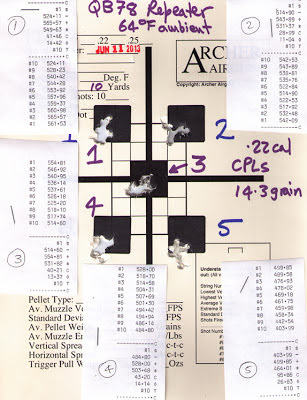 With any CO2 air rifle, consistent muzzle velocity is more important for shot-after-shot accuracy than achieving some higher maximum muzzle velocity that falls off rapidly when shooting, causing vertical stringing on the target. So, good shot-to-shot fps consistency will give good accuracy over a long string of shots. As the Repeater simply begs to be shot more and faster than the standard QB78 and QB79 single-shot versions, this is an important feature. 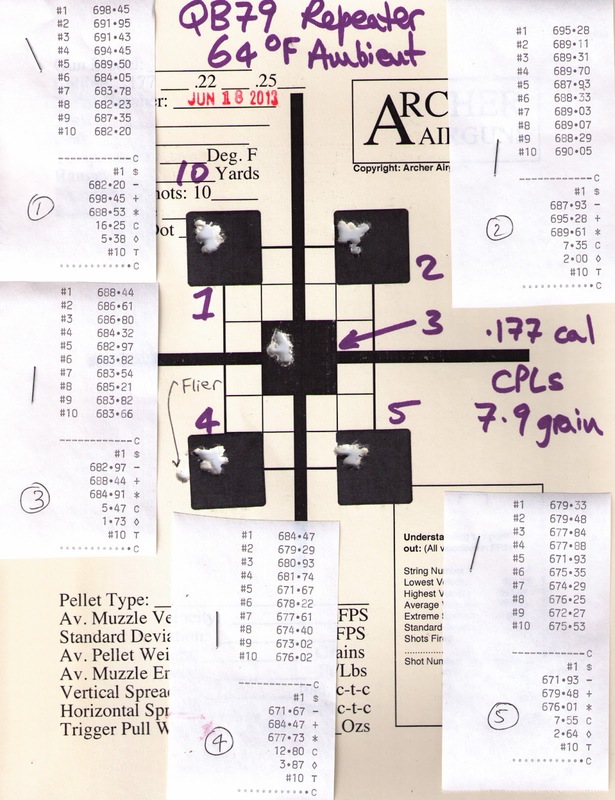 This test target shows how a QB79 Repeater performs in .22 caliber with a 50-shot, 5 magazine string fired at a 5 bull target (10 shots per bull). The shots were fired every 10 seconds, with a one minute break every 10 shots to re-load the magazine. 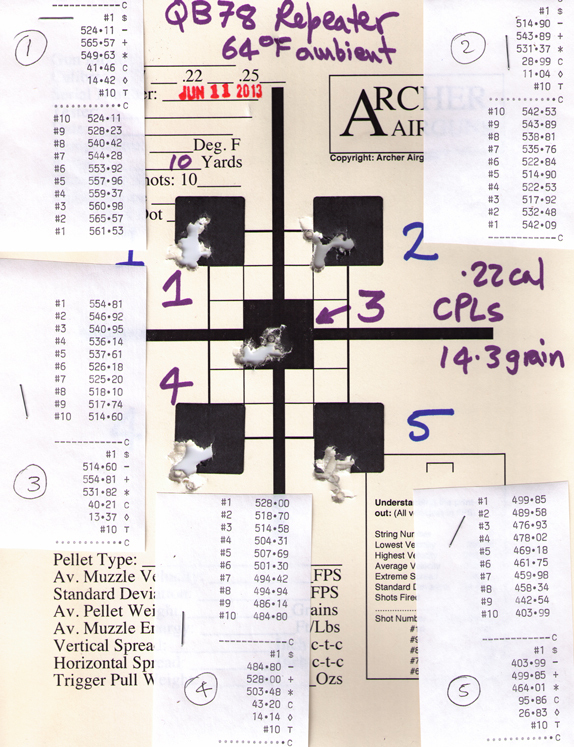 (OK, it's actually a 49-shot string as I pulled the magazine too soon on the fourth bull, my fault!). The Chrony prints are attached near to the appropriate bull. The chart below plots muzzle velocity against shots taken. 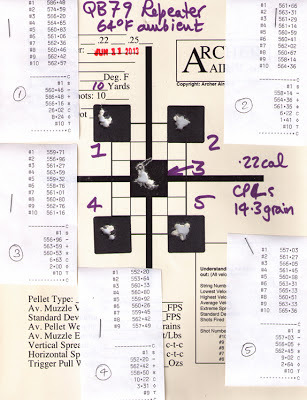 As you can see, the muzzle velocity was practically rock steady over the 49 shots at around 560 fps at the 64 degree range temperature. That's 60fps faster than the stock, single shot QB79 at this temperature in .22 caliber and equates to 580 fps at 75 degrees and 600 fps at 85 degrees F ambient temperatures. 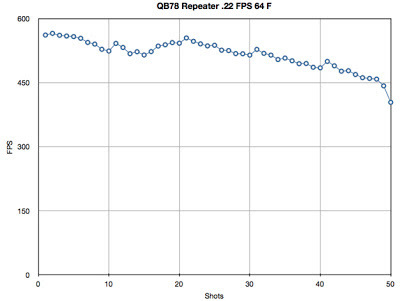 Of course, the big advantage of the QB79 Repeater for multi-shot shooting is it's large, 9-ounce CO2 capacity. 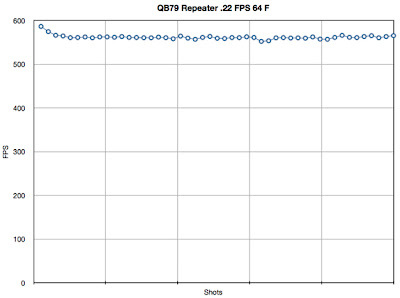 The QB78 Repeater holds much less gas and so is inherently more influenced by firing many, rapid shots. 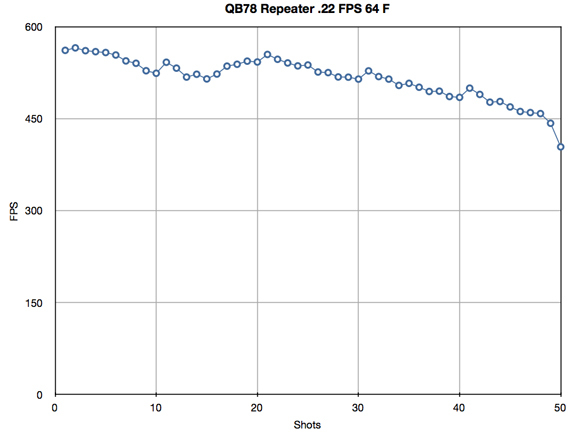 Yet the QB78 Repeater still turns in a very creditable multi-shot performance. A QB78 Repeater in .22 caliber was tested in exactly the same way - 10 shots strings fired every 10 seconds with a one minute break to reload the magazine. As you can see, the .22 cal QB78 Repeater gives 50 "good" shots before the muzzle velocity drops to unacceptable levels. Please note that this is the same performance as the stock gun that shoots 60fps slower and is only single shot! 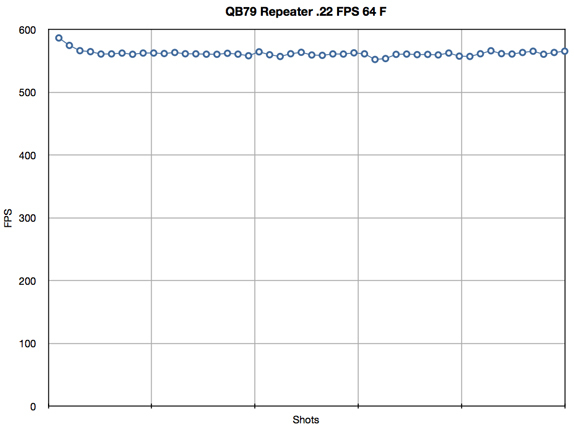 A graph of the muzzle velocity for this test shows that the smaller gas capacity of the QB78 platform causes the muzzle velocity to drop with each shot. It also shows how the fps recovers during the 60 second breaks of magazine loading. And note that we have 49 good shots here in the 5 bulls. 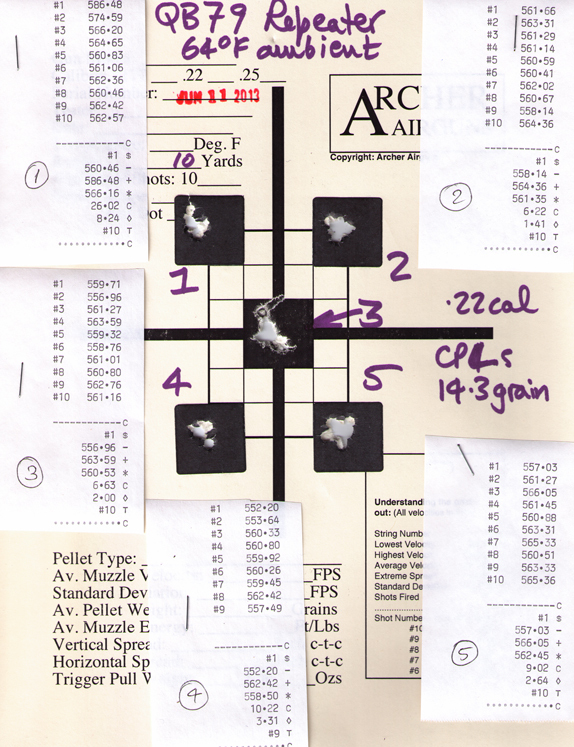 Only the 50th shot fell low as the muzzle velocity dropped 39fps after shot 49 with the CO2 nearly exhausted. These tests were conducted in our indoor range at 64 degrees F. When shot at higher temperatures - as these guns normally will be - the warming effect of the ambient temperature will reduce the cooling effect of the CO2 being shot and the muzzle velocities will be correspondingly higher and more consistent. We also can expect the .177 cal models to show less cooling effect due to temperature as these use less gas per shot - tests to follow. All this means that the QB78 Repeater in .22 caliber is very suitable for use as a multi-shot CO2 air rifle and that 50 good shots per fill of 2 x 12 gram Powerlets is achievable. It's a great upgrade for the many thousands of QB78-type air rifles that are currently in use and also very viable as a complete new airgun. The QB79 really shines as a Repeater with it's far greater CO2 capacity - we're talking 400 good shots per fill - giving a consistent 580 fps at 75 degrees F in .22 caliber, that's 10.7 ft/lbs of muzzle energy. For many shooters, this is an ideal airgun for everyday fun shooting, plinking, target practice and hunting small critters. As a direct result of customer requests, Archer Airguns has opened an airgun repair center specializing in resealing CO2 and PCP air rifles. 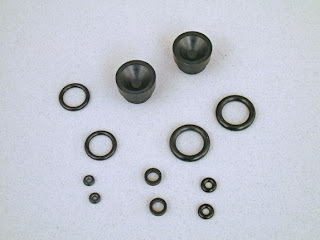 In addition to resealing any QB78 or QB79-type air rifle, Archer Airguns can reseal the Tech Force TF78, TF79 and TF78T airguns that were sold over many years by Compasseco. 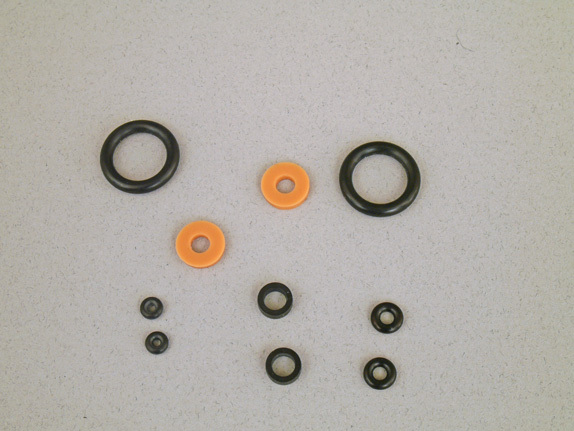 Both QB and Tech Force models can also be up-graded if required with popular Archer Airguns performance upgrades such as the XP Tune Kit at the time of resealing. So, your much-loved but leaking old TF78 (for example) can be resealed and upgraded in one easy step to give it a new lease of life! Together with Doug and Mike - our repair specialists - I attended training at the Crosman factory in order to become authorized as a Crosman Service Center. Archer Airguns now holds large stocks of repair parts for Marauder, Discovery and Challenger air rifles in order to provide our reseal services. 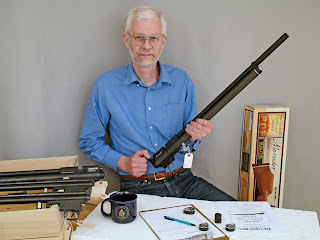 The photo shows Stephen Archer checking Benjamin Marauder and Discovery airguns before shipment back to their owners after resealing.